The press lunch that I’ll be attending today will be at the Museum of Modern Art. That means that at least the food should be good. 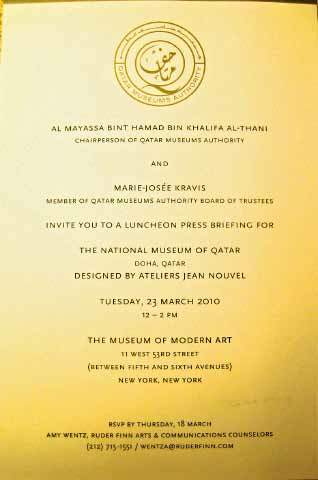 But, really, how do Al Mayassa Bint Hamad Bin Khalifa Al-Thani and Marie-Josée Kravis expect journalists like me to feel about our invitation to cover a story that was spoonfed to the NY Times‘ architecture critic in advance, so that he could scoop all of us in this morning’s newspaper (and on the web before 8:45 last night, when I saw his admiring appraisal of Jean Nouvel‘s design for the planned National Museum of Qatar)? The issuers of the above invitation are, respectively: the chairperson of the Qatar Museums Authority; and a “member of the Qatar Museums Authority Board of Trustees” (better known as MoMA’s president and the wife of American financier Henry Kravis). French architect’s most overtly poetic act of cultural synthesis yet. The rest of the scribe tribe, picking at whatever informational crumbs are left for us at today’s lunch, will have to opt for Catch-Up Journalism. Or perhaps we’ll focus on our plates and practice ketchup journalism. I suppose I should be served a compote of sour grapes. UPDATE: For a much more astute and productive use of one-on-one time with Nouvel, see today’s report by Bloomberg‘s indispensable architecture critic, James Russell.